This annual herbaceous trailing plant with large, dark green leaves, hollow stems, bright yellow blooms and elongated cylindrical fruit is an all time favourite with the backyard gardener. 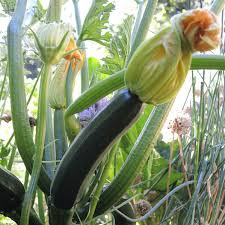 Zucchini here on the Coffs Coast can be grown in the dry season too, that is April through to August. Although some people still like to plant some from October (especially the yellow or gold variety which is more resistant to mould) as the humid conditions here are an open invitation for powdery mildew on other varieties. Seed can be sown directly in the ground but a good veggie gardener I know likes to start them off in small pots and transplant them about a month after germination. Companion plant near corn, beans, nasturtiums, parsley, silverbeet and tomatoes but avoid growing near potatoes. Plant in small mounds of free-draining soil enriched with compost and blood and bone. Plants spread to about 1.5m wide, so they do need their space. Two or three plants are adequate for most folk (even having enough for yummy pickles, cakes, slices and stuffed flowers). Keep the plants moist and apply a pelletised organic fertiliser monthly - although according to the Guiness World Records, the longest recorded zucchini is 2.52m and this plant was given heaps of water but no fertiliser! If powdery mildew appears on the leaves or stems, remove and bin affected material and spray remaining foliage with a registered organic fungicide.